The hunting experience with the the new OD40 is light nothing you have seen before. Yes that isn’t just a cool catch phrase. Its the truth. I have never seen a light so clean and so focused. Ive yet to have one animal flare from it. "Flaring" is a term us night hunters use when we spook animals with light. The science and technology behind the light allows me to hunt with a white light, where in the past I have had to use a filter to make a light red or green. I like white light. Good video, crisp clear target acquisition, and just plain fun! Identify the Vital Zone in the Distant Darkness with Optical Dynamics. The OD40 Kit with mount and cord switch is a long distance illuminator that projects a true collimated, focused beam of high definition light that has been created specifically for game identification in a hunting situation. It creates a crisp, clean, clear, focused circle of light at long distances. This not only allows animal or target identification but provides the hunter the ability to make a good, clean shot due to the clarity and definition of the light at longer distances. Optical Dynamics light projection technology puts the hunter in control. The focused beam of light is infinitely brighter, doesn't fade or disperse, doesn't leave dark spots and doesn't reflect back into your eyes to negatively affect your vision. It gives your natural eyesight the ability to function at its best without adverse reaction to reflected light which allows the hunter to hunt more comfortably, which equals slower hunts, better target acquisition, and more success. The OD40 is energy efficient and more effective than any other target-illuminating device on the market. You'll enjoy hour after hour of night hunting success. Optical Dynamics engineers have developed a revolutionary, patented photonics technology called CALS. This Collimated Amplified Lens System was engineered to truly project visibly harmonized and intensified light without the use of reflectors or diffusers. Pure, clear light that is so clean the waves of light are unaltered. This allows an animal to take the light without a negative reaction. 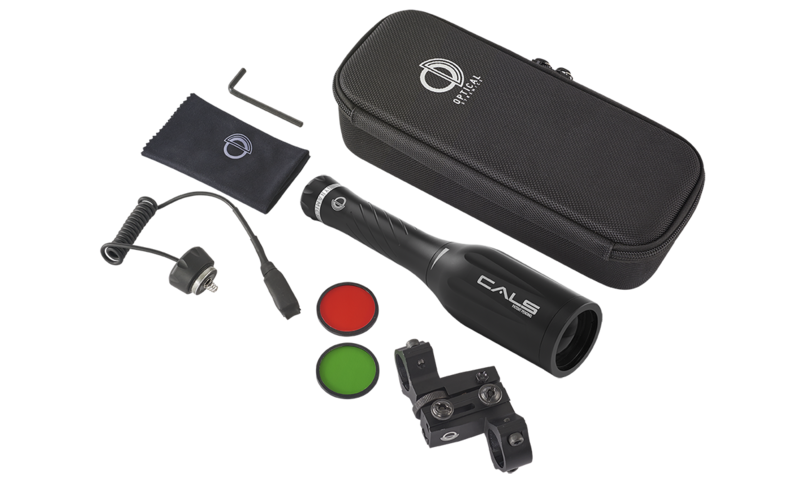 CALS combines specially engineered multi-coated precision lenses of the highest quality never before used in a light projection device for the outdoorsman. 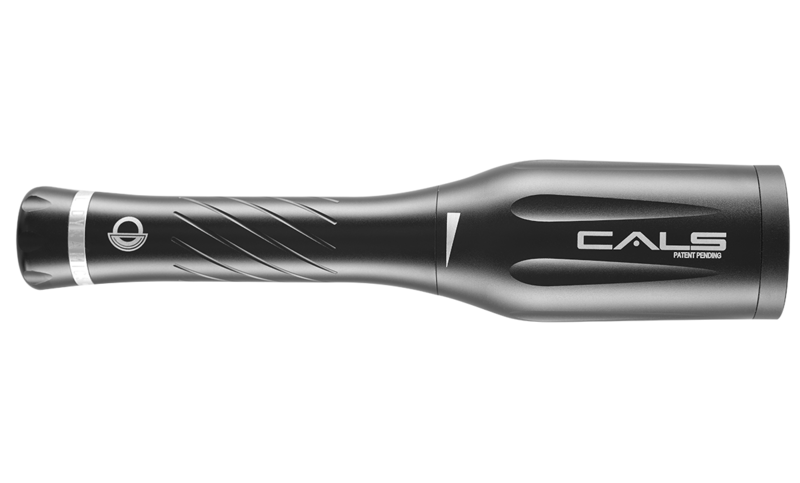 The system effectively captures 100% of the light generated from its CREE LED source and projects a gin-clear, narrow, adjustable column of pure light that clearly illuminates your target. No light is wasted, sprayed, or reflected back to illuminate the hunter. Mount and ergonomics allows for quick, no hassle target acquisition. The OD40 is compact, lightweight and easy to handle, carry, or mount onto a scope or rail with the Optical Dynamics mount. The OD mount, equipped with windage and elevation adjustments allow you to directly adjust the light to accommodate your optics for a no hassle, clear viewing of the target up to 200 yards. It weighs just 14 ounces with the two included CR123A batteries that provide constant operation up to 100 minutes. Its CREE LED delivers 720 lumens to the lenses that make up the CALS system. Constructed of aircraft grade aluminum, the Optical Dynamics OD40 is shockproof and resistant to water and momentary submersion. It measures just 8-1/2 inches long and is less than two-inches in diameter at its widest point. Unlike flashlights that reflect an uncontrolled diffused light, the OD40 projects a pure column of light that is measured in Field of View (FOV). Its illuminated FOV is 27 feet at 50 yards and up to 108 feet at 200 yards. The illuminated surface areas created by Optical Dynamics are conducive for use as night-vision in hunting situations. The OD40 optimizes the naked eye's natural vision by supplying a target identification distance of up to 150 yards. When used in conjunction with a scope the target identification distance increases by 33%. Light Nothing You Have Seen Before.